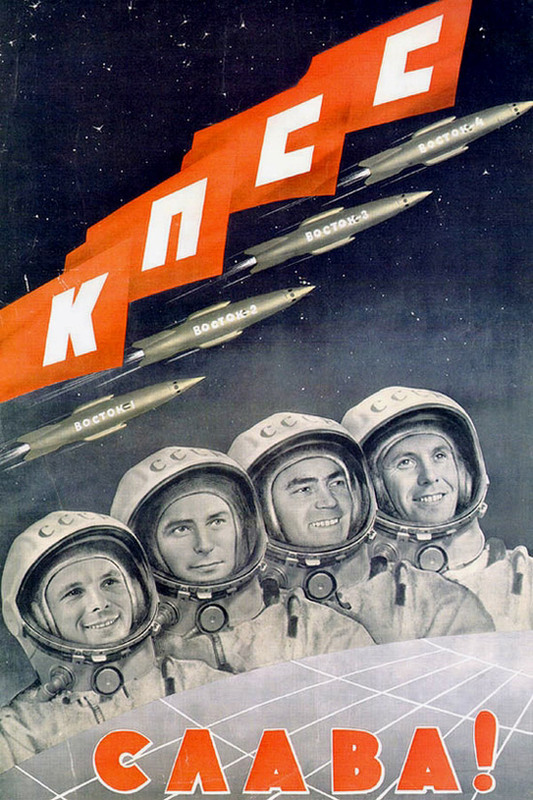 I am very excited to kick off the seventh conversation on the Russian History blog on the topic of Soviet/Russian space history. Instead of the usual focus on one monograph, we are using a number of recent texts that recover, explore, and rethink the intersections between “cosmic enthusiasm” (as the title of one of the books characterizes it) and Soviet/Russian culture. These are two individually authored monographs: my own The Red Rockets’ Glare: Spaceflight and the Soviet Imagination (Cambridge University Press, 2010) and Andrew Jenks’ The Cosmonaut Who Couldn’t Stop Smiling: The Life and Legend of Yuri Gagarin (Northern Illinois University Press, 2012), and two edited books that have some overlap: Eva Maurer, Julia Richers, Monica Ruthers, and Carmen Scheide, eds., Soviet Space Culture: Cosmic Enthusiasm in Socialist Societies (Macmillan, 2011) and James T. Andrews and Asif Siddiqi, eds., Into the Cosmos: Space Exploration and Soviet Culture (University of Pittsburgh Press, 2012). The appearance of these texts (as well as many other books and essays on Soviet space culture in the past few years) suggests that academic interest in the topic has attained a critical mass that warrants some self-reflection. Before we launch this exchange, I wanted to introduce and frame the topic and then raise a few pertinent questions to serve as a catalyst towards more in-depth discussion. Almost all of the recent works on Russian and Soviet space culture circumscribe their focus, implicitly if not explicitly, on two loosely constructed periods. The first is the roughly thirty-five-year span from 1890 to 1935 that saw the first burst of popular (and populist) interest in cosmic travel (in many ways rooted in the much larger Russian obsession with modern science and technology). The second period covers the 1950s and 1960s, around the time that cosmic dreaming became materially manifest in the early Sputniks, Vostoks, and so forth, as hero cosmonauts sailed into the unknown. In both of these periods, popular interest in space was driven by active popularizers–novelists, popular science writers, artists, poets, journalists, curators, and, in the second period, cosmonauts–all of whom to different degrees shaped the general contours of public discourse. If the earlier burst of enthusiasm lost its charge with the arrival of interwar Stalinism, the latter period’s fascination faded away as the Khrushchev era slid into complacent and disgruntled Stagnation. Focusing largely on these twin periods, historians, literary scholars, anthropologists, and cultural studies academics have begun to mine the vicissitudes of cosmic fascination, seeing in this obsession larger themes within Soviet civilization such as claims about modernity/modernization, technological utopianism, spiritualism, atheism, Cold War posturing, national identity, the construction of gender, generational mobilization, the future of socialism, etc. All of these four texts engage with one or more of these broad themes, and each invites us to rethink larger issues of Soviet and Russian history. I have organized my questions around four thematic issues that I explain below. First, I want to amplify a point I made in Red Rockets’ Glare about the co-production of imagination and engineering in Soviet space culture. Let me explain here. When I was working on my dissertation in the early 2000s (in what would eventually become Red Rockets’ Glare), I had set out to write an ostensibly Cold War story about the Soviet drive to conquer space, now with the benefit of archival materials. But as I got deeper and deeper into the research, I found myself subsumed in what I initially thought of as cultural ephemera—popular science, fictions, movies, posters, art, music, theater, and so on—but which proved to be not only perdurable but critical to understanding the Soviet drive to the cosmos. The enormous richness of this fascination with the cosmos, as embodied in discourses, objects, and practices, was intimidating at first but I soon realized, essential to telling any story about the space program. My second point has to do with the Russian spaceflight theorist Konstantin Tsiolkovskii who makes an appearance in practically every work on Soviet space culture, often as an obligatory punctuation (or question?) mark in the grammar of Russian cosmic enthusiasm, and sometimes as a metonym for all manner of intellectual strands in the Russian thought. Tsiolkovskii—especially his carefully constructed image—undoubtedly had a profound impact on the shape and nature of Soviet space culture. In fact, his influence, I would argue extends far beyond space culture, into many other arenas of Soviet intellectual history. Yet we do not have a comprehensive and critical biography of Tsiolkovskii in the English language, especially one that integrates his technological utopianism, religious millenarianism, occult leanings, eugenicist ideals, obsession with air (not space) ships, and of course, his cosmic aspirations. 2 Scholars such as Michael Hagemeister have done much to dispel some of the myths surrounding Tsiolkovskii that continue to endure, such as the supposed influence of philosopher Nikolai Fedorov on his worldview. Many other misconceptions abound, such as the notion that the Soviet government plucked Tsiolkovskii out of obscurity in the aftermath of 1917 and lavished him with praise and pensions, when in fact, he was willfully ignored by the Soviet Academy of Sciences his entire life and the Stalinist state only paid attention to him during the last three years of his life. I would be curious to see our other bloggers meditate on the pitfalls and challenges of situating such a complex figure as Tsiolkovskii in accounts of Soviet space culture, given the edifice of hagiography that protects his memory from critique in contemporary Russia. 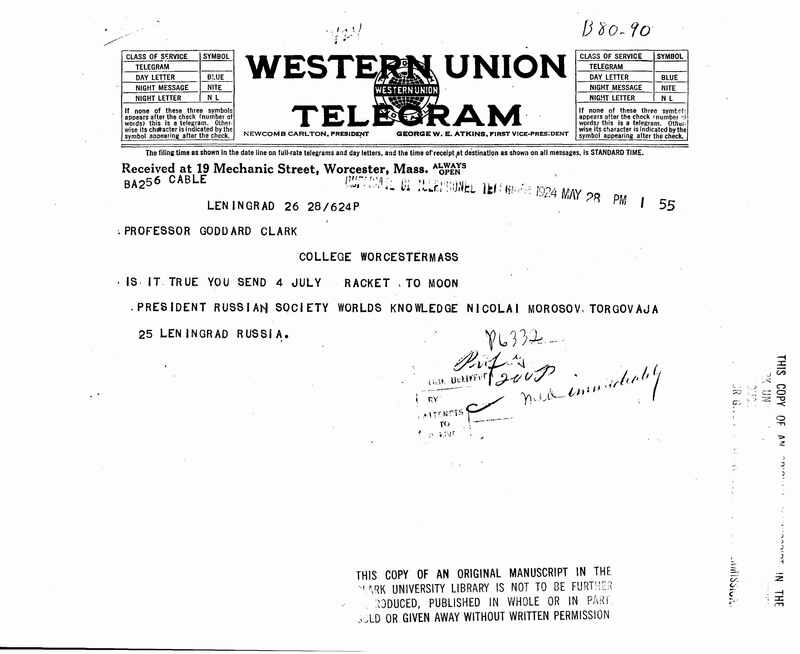 Telegram from Russian space enthusiast N. A. Morozov to American rocket pioneer Robert Goddard inquiring whether Goddard had launched a rocket to the Moon in 1924. My third point has to do with the transnational nature of Soviet space culture, one that is beginning to attract some attention, with work by Lewis Siegelbaum who has written on Soviet space exhibits abroad and by Tat’iana Zhelnina, a curator at the K. E. Tsiolkovskii State Museum on the History of Cosmonautics in Kaluga who has written on Soviet-German connections in the 1920s. It is evident that already by the 1920s, Soviet space culture was but one node in a transcontinental matrix of circulation that included Germany, Austria, France, Italy, Great Britain, and the United States. Books were traded, ideas exchanged, claims staked, and dreams were exaggerated and reformulated as they crossed borders and communities, often in entirely unexpected ways. We have for instance, the example of Russian popular science writers Nikolai Rynin and Iakov Perel’man who communicated actively with dozens of correspondents abroad 3. Such exchanges reduced but ever entirely subsided even at the zenith of inward-looking Stalinist gaze, but took on new and subtle forms. For example, in 1952, satellite pioneer Mikhail Tikhonravov had his entire staff watch a bootleg copy of the German classic Frau im Mond (Woman in the Moon, 1929), inspiring them in unexpected ways. I found letters from American space enthusiasts written to their Soviet counterparts in the early 1950s that were stored at GARF. Such contacts expanded in the 1950s and 1960s and took on new forms during the Thaw years as the aestheticized imagery of space travel moved across continents through exhibitions, texts, cosmonaut visits, and so forth, are extremely important. 4 In that sense, it may be useful to ask what was particularly “Russian” (or “Soviet”) about the visual, textual, and artifactual tropes of Russian space culture, a question that, I think, begs a comparative view of space culture. There is an abundance of excellent work on space culture in the United States, particularly the work of Howard McCurdy, and more recent work on the so-called “astroculture” in Western Europe by Alexander Geppert 5. I would ask my fellow bloggers to add their thoughts on the possibilities of comparative or truly transnational works, ones that might help us situate this phenomenon not only within Russian history but also global history. The fourth and final point is an echo of the “What-makes-it-Russian” notion from above: What is about the upsurge of cosmic enthusiasm in Soviet culture that is at heart a story about popular/populist campaigns in Soviet history rather than about space? There are other points of comparison here–for example, Arctic exploration and aviation heroics in the 1930s–that cultivated similar discourses, about the vanguard power of the Soviet state to break new frontiers of time and space, about its ability to inspire generations of young Soviet citizens, and to advertise the prowess of the Soviet state abroad. What can we, then say, about all this activity, particularly in relation to other popular campaigns to mobilize the population that were state-identified but had their own dynamics and unintended trajectories. With that, let me briefly introduce the group of scholars who are participating in this conversation. Anindita Banerjee is Associate Professor of Comparative Literature at Cornell University. She is a member of the Institute for European Studies, the South Asia Program, and the Visual Studies Program, and a fellow of the Atkinson Center for a Sustainable Future at Cornell. Her research explores the interfaces between techno-scientific, cultural, and social imaginations across Russia, Eurasia, and the Indian subcontinent. She is particularly interested in science fictional literature and media, which play a crucial role in negotiating trans-local practices and global understandings of modernity. The subject is explored at length in her book, We Modern People: Science Fiction and the Making of Russian Modernity (Wesleyan University Press, 2012), which won the first Science Fiction and Technoculture Studies book award. Andrew Jenks is Associate Professor of History at California State University Long Beach. He specializes in the history of modern Europe, Russia, environment, and science. He published Perils of Progress (2010), a book on disasters that examines four large-scale environmental and technological tragedies in the twentieth century. His most recent book (The Cosmonaut Who Couldn’t Stop Smiling: the Life and Legend of Yuri Gagarin) explores modern Soviet and Russian history through the life and times of the first man in space, Yuri Gagarin. His recent research has led him into the archives of NASA courtesy of a grant from NASA and the American Historical Association. He is examining the period of the late Cold War and détente through the history of joint manned space flight missions, beginning with the Apollo-Soyuz space venture of 1975. Lewis Siegelbaum is Jack & Margaret Sweet Professor of History at Michigan State University. He has been teaching Russian and European history at Michigan State University for more than a quarter of a century. He migrated from labor history to the history of consumption and material culture in the Soviet Union with some digressions along the way, and in the process shifted his attention from the Stalin era to the late Soviet period. He is co-author of the award-winning website Seventeen Moments in Soviet History and his book, Cars for Comrades: The Life of the Soviet Automobile (Cornell, 2008), was awarded two prizes by the American Association for the Advancement of Slavic Studies. In 2011, he was appointed the Jack and Margaret Sweet Professor of History, a Russian edition of Cars for Comrades was published by ROSSPEN in Moscow, and The Socialist Car: Automobility in the Eastern Bloc, a collection of 11 essays that he edited, was published by Cornell University Press. He also became editor-in-chief of REGION, a new journal based in Seoul, South Korea devoted to Russia and the former Eastern Bloc. I am Professor of History at Fordham University. I am on leave in 2013-2014 as the Charles A. Lindbergh Chair in Aerospace History at the Smithsonian Institution. This entry was posted in Blog Conversations, Russian Space History, Soviet and Russian Space Flight, Uncategorized. Bookmark the permalink. Asif has gotten us off to a great start. I am not going to attempt to answer any of his four questions, though. Rather, I am going to ask one of my own. Asif writes: “If the earlier burst of enthusiasm lost its charge with the arrival of interwar Stalinism, the latter period’s fascination faded away as the Khrushchev era slid into complacent and disgruntled Stagnation.” This, it seems to me, elides the question of the relationship between Stagnation and the loss of appeal of space exploration. Is it possible that the Soviet public got complacent (if not disgruntled) about space exploration before the onset of Stagnation? This question in turn presupposes that we agree on when Stagnation began, or even whether it is a useful category of analysis. A conference in Amsterdam in March 2012 explored its utility and found it quite limited, actually. So what – if not “Stagnation” – led to the decline of popular interest in space exploration? Good point, Lewis about the problems of dealing with received categories such as “Stagnation” especially in light of the new work that suggests that we need to rethink such shorthand notions. But quickly going back to what I was saying in my original post: I was not suggesting that “Stagnation” (or more precisely late-period Brezhnev era) was the cause of the decline of interest in space exploration but rather it coincided with it. I would also clarify my point that, it was not that interest in space exploration necessarily declined in the 1970s and 1980s but that it took on new forms and manifestations. Certainly, the explosion of popular/populist expression characteristic of the 1960s was dampened. In its place, I would argue, appeared a more sober-minded, somewhat mechanical, somewhat cynical, and often ironic interest in all things space. Interestingly, this transformation of the original interest in the cosmos also happened in the West, when the 1960s (“space race” and so forth) transmuted into other forms by the 1970s. As always, Asif makes an incisive point here – that Brezhnev era stagnation and the decline of interest in space exploration merely coincided, and that it was paralleled by a similar dynamic in the West. The interactive nature of US and Soviet space programs is a topic that seems worthy of new look with hindsight (and newly available sources). The narrative most of us have inherited tends to see the space race era from one side of the Cold War or the other. I wonder what new light might be shed on these issues by scholars conversant in the technical (as Asif notes in another thread of this discussion) and the socio-political details of both sides. Perhaps this is a challenge that could only be met by a team approach. But it strikes me that it might be a very fruitful effort. For example, it might shed some light on why space exploration goals were so strongly reigned-in by political leaders on both sides after the U.S. won the race to the Moon – and the impact of those changes on public enthusiasm. In 1989, while visiting the Tsiolkovskiy Museum in Kaluga, I was asked by the staff to search out the letters Tsiolkovskiy had sent to emigré Russian artist and futurist David Burliuk, then [1933-4] in New York. “We have the letters Burliuk sent to Kaluga,” they explained, “but no copies of Tsiolkovskiy’s original letters to him.” Skeptical of my own abilities, I still tracked down Burliuk’s family, located his papers that he had donated to the University of Syracuse, and spent an afternoon searching through the three boxes there [timeline has been compressed!]. I found references to the correspondence, but not the original letters, alas. But as part of the discovery process, I found at least some interesting adds for Burliuk’s biography, http://en.wikipedia.org/wiki/David_Burliuk, which stated: “[In 1917] Burliuk began traveling to the United States, a process that took him through Siberia, Japan, and Canada and wasn’t complete until 1922.” I talked with his son, who recalls half a year they spent in French Polynesia, where the family wandered the beaches for driftwood that Burliuk carved into knicknacks for tourists, to stay alive. The Tsiolkovskiy letters, sadly, part of the process of international intellectual cross-fertilization that Asif cited, are lost to history. …I’m looking forward to reading – dare I say it? – *poly*graphs this blog will present. It’s especially rewarding to see Asif’s participation, considering Challenge to Apollo: The Soviet Union and the Space Race, 1945-1974 is still the definitive text for understanding just what the Rooskies were up to during those Glory Days for both sides of this particular aspect of the Cold War. Thanks to the fact that it’s now split into two volumes and available on paperback, the risk of said tome falling on small children and pets – a valid concern when the original tome was released, based on some back-of-the-napkin figures we did on sci.space.history at the time – has been greatly reduced. Still, that book had a major impact on all our understanding of how Korolev and his team accomplished their Space Firsts considering all of the detrimental and competing factors they faced, factors that would eventually result in the Soviets losing the Race to the Moon. Despite the hazard to small children and pets, the original hardback of “Challenge to Apollo” is still in plentiful supply – in fact, we have enough of them piled up at the NASA History Program that you can get a copy for free – while supplies last. Your only cost: $3 for shipping. This same offer applies to a number of other works that may be of interest to those engaged in this conversation. For example: all 4 volumes of Chertok’s Rockets and People, and the Societal Impact of Space Exploration (the volume from our 2005 on that topic). …My own copy was pre-ordered the day such pre-ordering was allowed, and to be honest it’s one of the few full-price books I’ve purchased in the past two decades where it was cheap at twice the price. The year it was split into two kid-safe volumes, I bought 12 sets for relatives who have picked up the 4th and 5th-generation Astrobug from me, and the one copy of the single-volume HC that I’ve found over at the HPBS across from JSC – where else? – went to the son of one of my ex’s who’s finishing his masters in Slavic languages and history, and plans to go to visit the evil Soviet Empire for an extended stay in 2016, provided his Significant Whatever can keep from trying to reproduce just a year or two longer. …Still, Bill brings up a good point: what’s needed is a bibliography of -must read- books on the Space Race during the Glory Years, which takes place from VonBraun’s A-x series all the way up to its peaceful culmination of ASTP – where Asif, IMHO, erred by not ending his cat-flatter with a conclusatory section showing his own take on the arguments I presented on my own ASTP pages, in that this joint mission did more than any other event in the 20th century to enact a peaceable thaw in the Cold War that stayed melted. …So again, I propose that such a list be debated, titles and authors contributed to the pile, and after, say, a year from now the first of these “recommended reading lists” should be presented for the *eigth* conversation. Hell, it’ll give me more incentive to get my ASTP page back up and online even if it’s just to be rejected outright on the grounds that it shows no reverence towards those who would have preferred the budgets spent renovating their offices. Thanks Jim for the very interesting comment. That’s exactly the type of exchange I was talking about, i.e., not necessarily at the state level but through individuals and “non-professionals.” I will definitely look into the Burliuk case next time I am in Moscow. Scholars such as Michael Hagemeister have done much to dispel some of the myths surrounding Tsiolkovskii that continue to endure, such as the supposed influence of philosopher Nikolai Fedorov on his worldview. I am quite interested in this, since I too have been a victim of that myth; would it be possible to provide a link or two (or, if the information is not online, a reference or two) where I could get more information? I do read German, if haltingly and grumpily, but would prefer sources in English and Russian if they are available. In my book (Red Rockets’ Glare, pp. 80-81), I also explore the relationship between Tsiolkovskii and Fedorov. There’s no firm evidence to suggest that Tsiolkovskii ever drew his ideas about spaceflight from Fedorov. 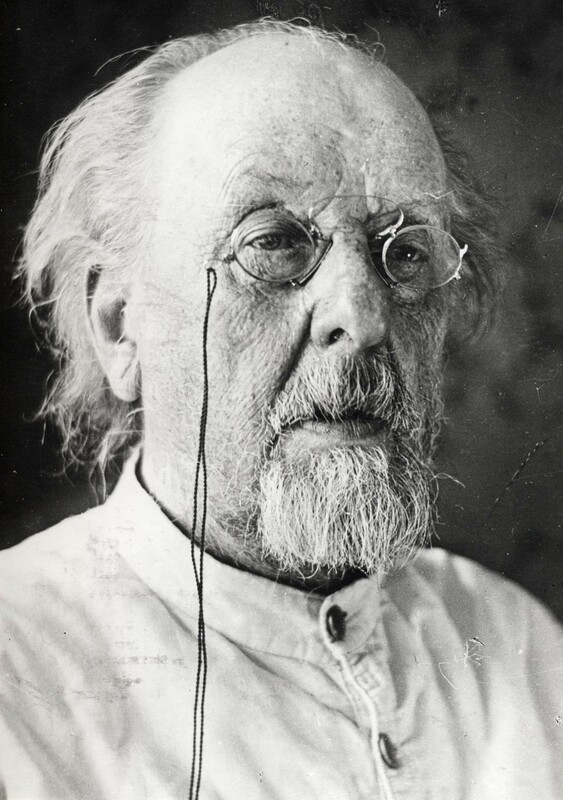 I wanted to make a couple shamefully “internalist” comments about Tsiolkovsky and is technical ideas. Writings about the scientific merit of his work range from exuberant praise to denunciation as nothing more than a myth of Soviet propaganda (e.g., G.M. Salakhutdinov). I believe his achievements were novel and notable. First, Tsiolkovsky is credited with the discovery of the “rocket equation”, and the important role of exhaust velocity and mass ratio. Most authors are quick to point out he was not the first to derive the formula for the final velocity of a rocket. In fact, integrating the equation of motion for a rocket is a trivial calculus problem, and at least one 19th century physics text gave it as a student exercise. It’s often pointed out that the equation was published by Meshchersky or even refer to the rocket equations as the “Meshchersky-Tsiolkovsky equation”. I don’t believe Meshchersky is interesting in this context, because as I said, it is a trivial calculation done by countless people. Writers like Salakhutdinov bring up this issue to dismiss the importance of Tsiolkovsky’s calculations. However, the important point is that Tsiolkovsky used this equation to study the question of whether space-flight velocity could be achieved by a rocket. Earlier people were thinking about the motion of war rockets or fireworks. The answer to the question of spaceflight is yes…but just barely yes. As K.J. Bossart once pointed out, we are very lucky that spaceflight is possible. If the Earth was just a little larger, gravity just a little stronger, no chemically powered rocket no matter how large could achieve orbital velocity. The French rocket enthusiast, Esnault-Pelterie tackled the question of space flight by rocket in 1912. He also derived the rocket equation, but made a grievous error about mass ratio that caused him to predict that space flight by chemical rocket was impossible. The second notable idea of Tsiolkovsky was the liquid fuel rocket. Was he the first to propose it? Black powder rockets cannot achieve space flight velocity, because their specific impulse is far too low. Did Tsiolkovsky know or calculate the specific impulse of black powder? Was that why he thought hard about how to achieve higher exhaust velocity with more energetic fuel? It was a bold and timely proposal, since hydrogen was first liquefied in 1898. It seems strange that he does not explicitly discuss the problem with black powder, the typical rocket fuel of his day, and then introduce the LOX/LH2 rocket as the solution. Given the quirkiness of his thinking, it is also quite possible that he just immediately seized on the novel idea and never studied the question of traditional black powder. Tsiolkovsky’s calculation of the exhaust velocity for LOX/LH2 was clever for an amateur scientist, but he made the mistake of not accounting for dissociation (the reverse endothermic reaction of water splitting into hydrogen and oxygen). Thus, he believed he could reach a 5700 m/s exhaust speed, while the realistic value is about 4400 m/s. We might laugh at his diagrams of rockets with their big cargo compartments, but thinking that he had a specific impulse of 570 seconds, he did not have to worry much about mass ratio. Mass ratio is related exponentially to specific impulse, and modern designers would jump for joy if they could get 570 s from a fuel. Tsiolkovsky discussed the problem of dissociation and the maximum temperature of a hydrogen flame in 1914, but he never amended his calculation of exhaust velocity (probably because he did not know how to calculate that). While Tsiolkovsky may have been led to the idea of the liquid fuel rocket by a quest for higher exhaust velocity, Goddard reached the idea while trying to reduce the mass ratio of rockets. Goddard was concerned that solid fuel rockets needed a heavy structure, because the entire vehicle was a high-pressure combustion chamber. So in fact, there are two good reasons to use liquid fuel. Wow, thanks for an avalanche of about a dozen aspects of Tsiolkovskiy and ‘rocket science’ that I didn’t even know I didn’t know. Terrific comment! Don, all very good observations. Unfortunately, there has yet to be a good technical evaluation of Tsiolkovskii’s works that compares it with Goddard, Oberth, and others. My feeling is that both Tsander and Kondratiuk need to be in the conversation about Russian space pioneers. The contributions of both (esp. Kondratiuk) were very impressive even in comparison to Oberth, Esnault-Pelteries, etc.